Sure, takeout pizza is pretty cheap, and very easy and isn't that the point? 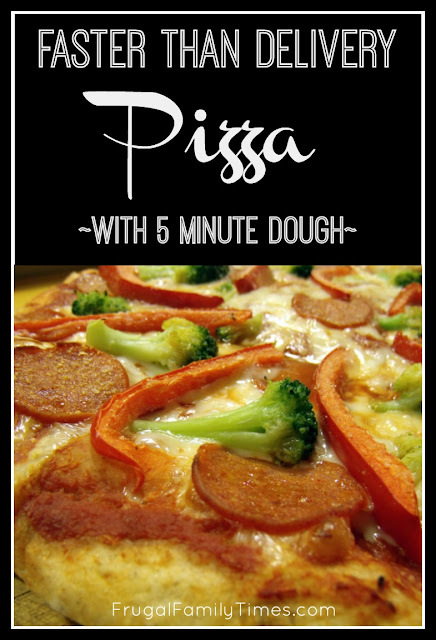 With a batch of 5-minute bread dough and fresh (or frozen) ingredients you can have pizza cheaper and quicker than waiting for delivery. 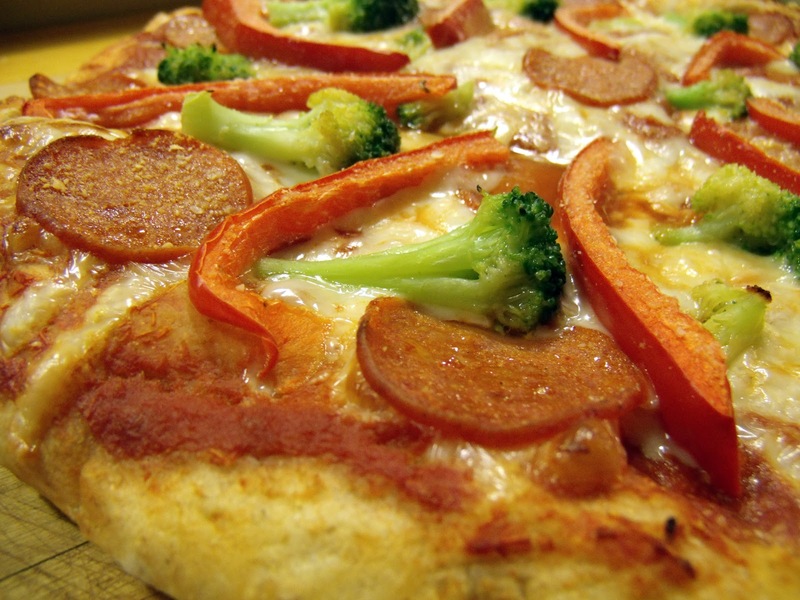 Homemade pizza is fun and easy and I defy you to find a tastier crust that isn't loaded with fat. 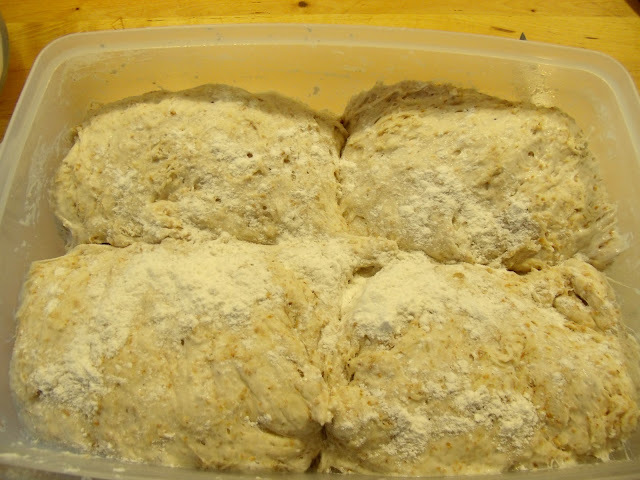 At least 1/4 batch of 5 minute Bread Dough (I use half a batch in this recipe). Here's more info on the cookbook "Artisan Bread in 5 Minutes A Day". 1. 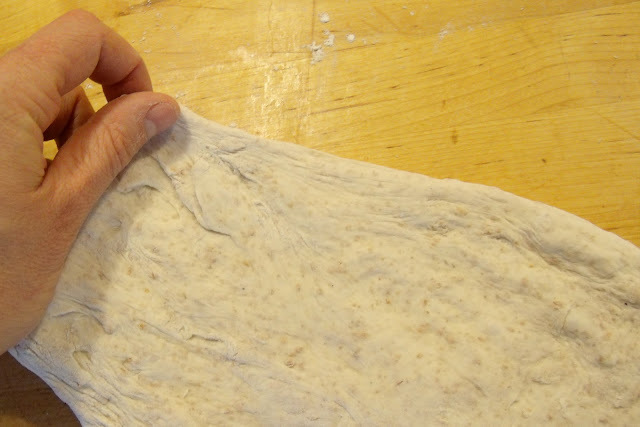 Take out your 5-minute Bread from the fridge and score it with a wet serrated knife (if your dough is fresh and uncut like ours was). One batch should make 4 pizzas (or loaves, or whatever). 2. Dust the dough with flour. And by dust, I mean snowstorm. 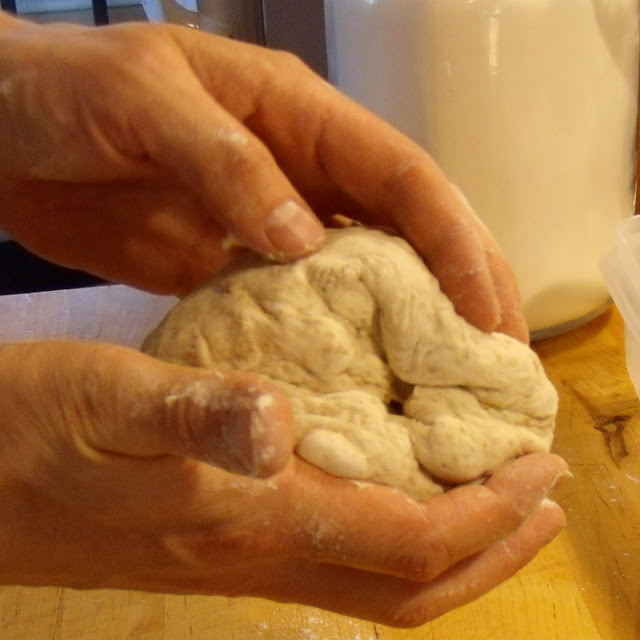 The 5-minute dough is a wet mix and will absorb a lot of what you throw at it. You will appreciate the extra flour when you are flattening this sucker into a pizza crust. 4. The bottom of your dough ball will look something like this after you finish the smooth-tuck step above. Remember, this dough does not need kneading - there is no waiting in any of these steps. 6. 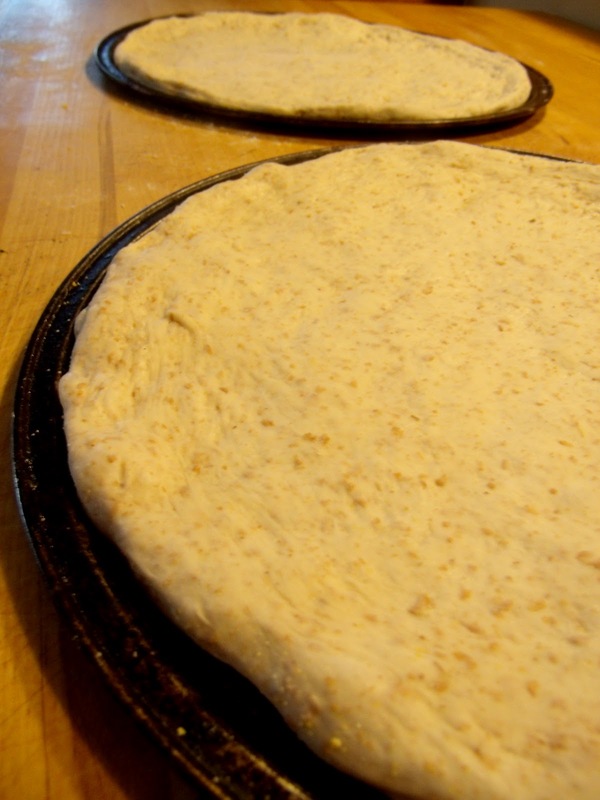 ...transfer it to an spray-oiled and lightly cornstarched (or floured) pizza pan. Continue forming it as needed. 7. My final pizzas, ready for dressing. Preaheat oven to 450F. Pizza dough will rise a bit while oven heats, you chop toppings and grate cheese. 8. 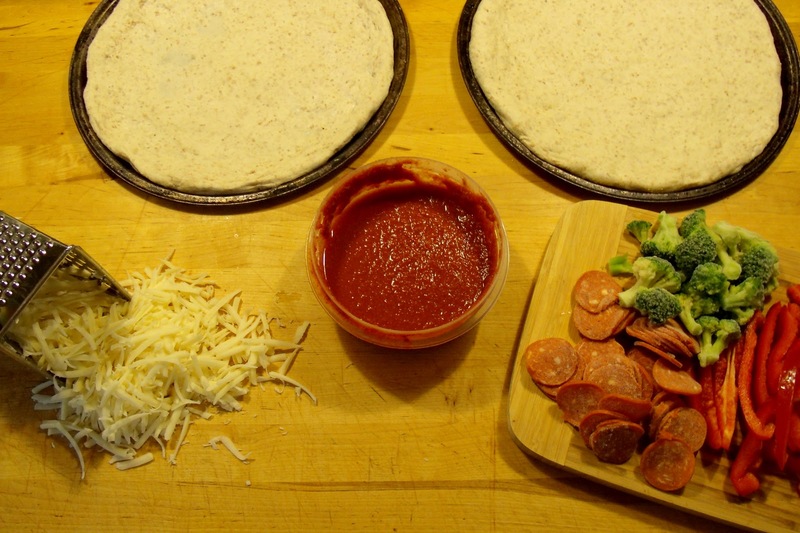 Requisite shot of pizza toppings, ready to go. We open a big can of crushed tomatoes and use less than half for two pizzas and sprinkle with your seasonings of choice. The rest goes in the fridge until we make a pasta sauce, chili or something else tomato based. 9. 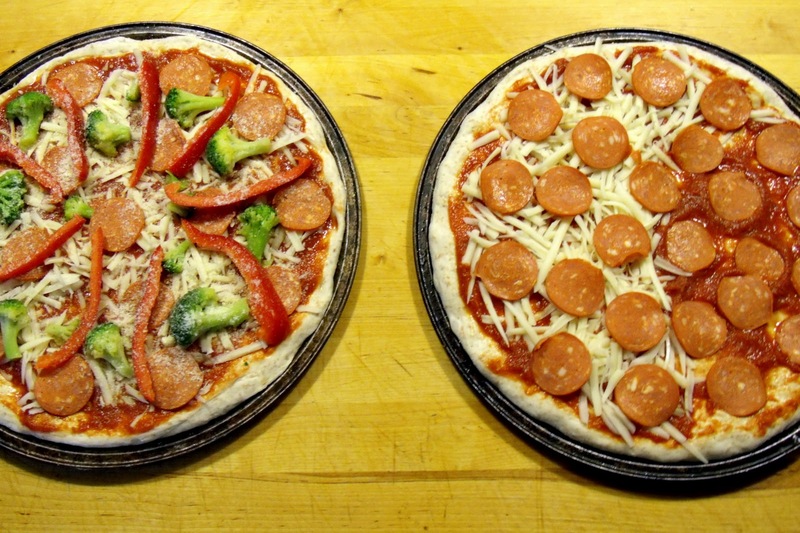 Completed pizzas. Can you tell our daughter made the one on the left? She believes that pizzas with flower formation toppings are just tastier. Notice the 1/3rd with only sauce and pepperoni. Now you can make your crazy kid requests at home and not have to worry about the delivery place messing it up (or questioning your parenting). The other 5 minute bread recipe I will post needs a baking stone and a steam tray, but this one cooks just fine on the rack like normal pizza. 10. Bake at 450F for 15 mins (+/-) or until the cheese looks bubbly and golden. Serve with salad and cut fresh veggies. Enjoy! Love the bread,can't t wait to try this out! We love it at our house. Hope you'll let us know how it goes over at yours! 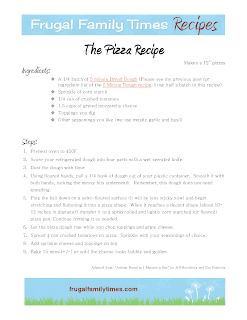 We have pizza every Fri night,after trying this out it will be served this Fri.Mason loved making it,but still wouldn't eat it,more for me!Easily saves 20bucks a week! 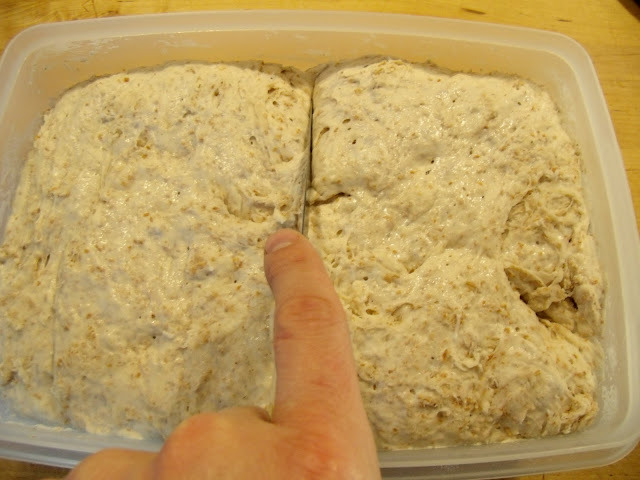 I've been making this bread for a long time, but somehow never thought to use it for pizza dough. Duh! :) Could you direct me to the baking stone and steam tray version? I'd like to try that! Put a pizza or baking stone in the oven - let it preheat fully (this often takes 15-20 minutes longer than preheating an empty oven). While it preheats, put a metal brownie or pie tin on a lower rack and half-fill it with water. When the oven preheats fully, be careful when you open it, as there will be a wall of heat/steam that smacks you in the face. 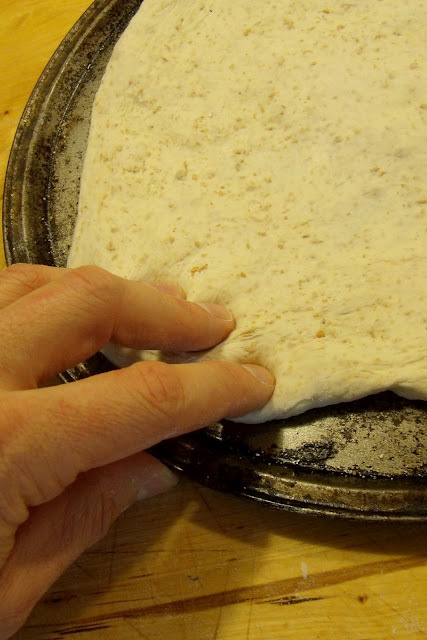 Place your pizza sheet on the stone (or, for the adventurous, use a wooden pizza peel to slide it directly onto the stone). Cook, as you normally would, using the browned, bubbly cheese as your benchmark for "done". 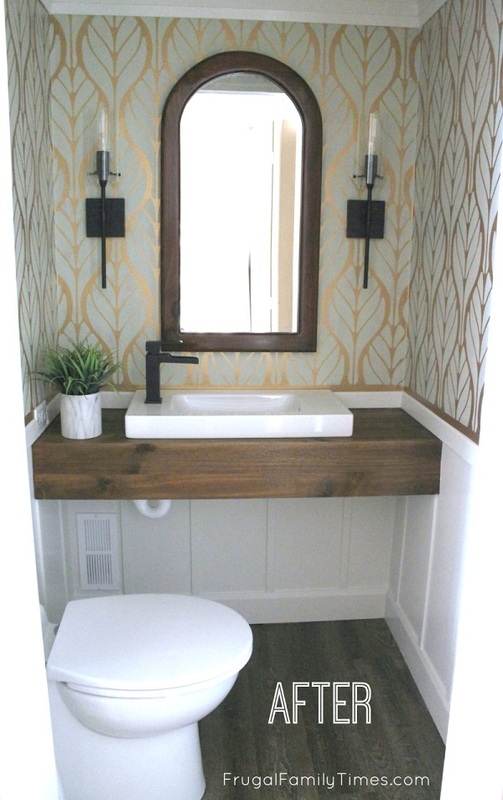 Your daughter did a pretty impressive job! 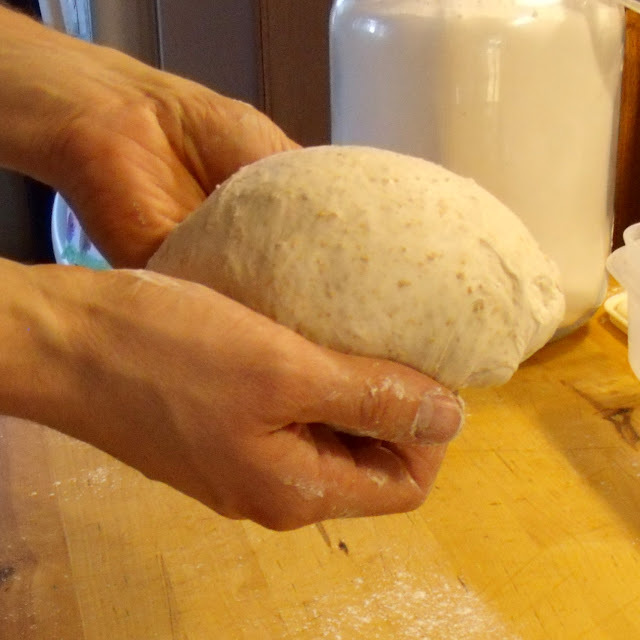 Your tips regarding handling of the dough are on point as well. It's never easy at first, takes practice like anything else.